Soya is a wonderful source of protein, especially for vegetarians, and it can be smartly combined with rice to make a valuable protein-carbohydrate combo. 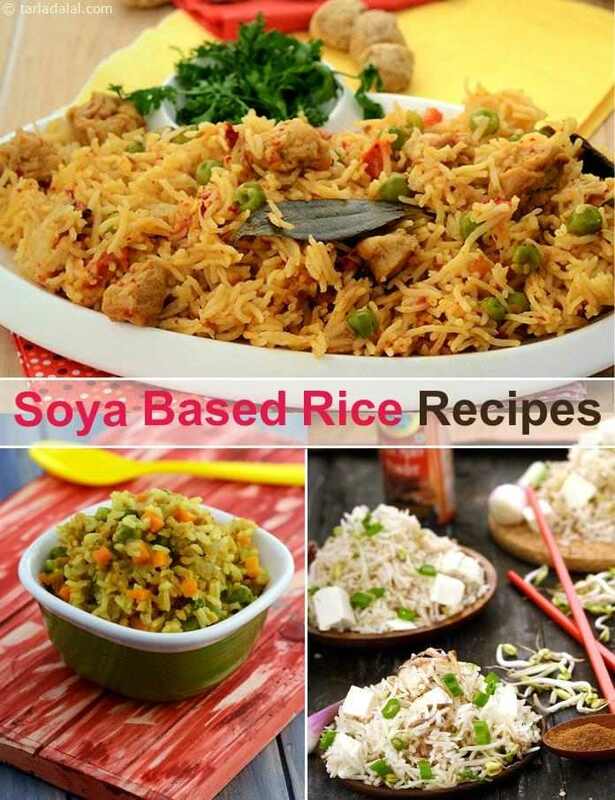 This section features recipes that combine rice with soya products like soya chunks, soya granules, tofu, etc., to make delectable dishes like Soya and Vegetable Pulao , and Soya Mutter Pulao . Simple, easy and healthful rice recipe with chopped tofu or soya paneer pieces cooked with potatoes and whole Indian spices. Tofu rice brings a healthy variation to the good old pulao or chawal recipe and is loaded with goodness of protein rich tofu. Soya biryani is a protein rich biryani recipe with the soya chunks cooked and then added to rice along with whole spices and garam masala powder. Soy milk vegetable pulao, rice cooked in soya milk with vegetables, tofu and mild spices that complement the rice is nutrient rich and good for health.